Sunday next, 15 July 2018, is the Seventh Sunday after Trinity. The broadcast service on RTÉ on Sunday morning comes from Saint Mary’s Cathedral, Limerick, using the paired lectionary readings. The celebrant is the Dean of Saint Mary’s, the Very Revd Niall Sloane, I am the preacher, and other participants include the Revd Edna Wakeley and the Revd Paul Fitzpatrick. The choir is conducted by Peter Barley. Continuous readings: II Samuel 6: 1-5, 12b-19; Psalm 24; Ephesians 1: 3-14; Mark 6: 14-29. Paired readings: Amos 7: 7-15; Psalm 85: 8-13; Ephesians 1: 3-14; Mark 6: 14-29. Two of my own places for regular pilgrimage, retreat and renewal are the Chapel of the Hospital of Saint John the Baptist in Lichfield, where I had my first adult experience of being filled with the light and love of God, and where I was invited to preach a few years ago at the Festal Eucharist on the Feast of the Birth of Saint John the Baptist; and the Monastery of Saint John the Baptist in Tollenshunt Knights, which I tried to visit once a year when I was on study leave in Cambridge. In Our Old Testament reading next Sunday morning (II Samuel 6: 1-5, 12b-19), David sets out on a pilgrimage to bring the Ark of the Covenant to Mount Zion, to Jerusalem. But it is not a journey without cost. Seeing David’s behaviour, his wife Michal despises and loathes him in her heart (verse 16). In our Gospel reading (Mark 6: 14-29), we are caught in an in-between time. At one bookend, we have the previous Sunday’s reading, when Christ is faced with rejection when he returns home to Nazareth and when he warns the disciples that they too face rejection in their ministry and mission. The other bookend is an episode later in this chapter (30-32), when Christ calls his disciples together to go with him to a deserted place and to rest a while. Pilgrimage and retreat are not necessarily about spiritual comfort and solace. Sometimes they are about preparing to face the truth, to face the world as it really is. 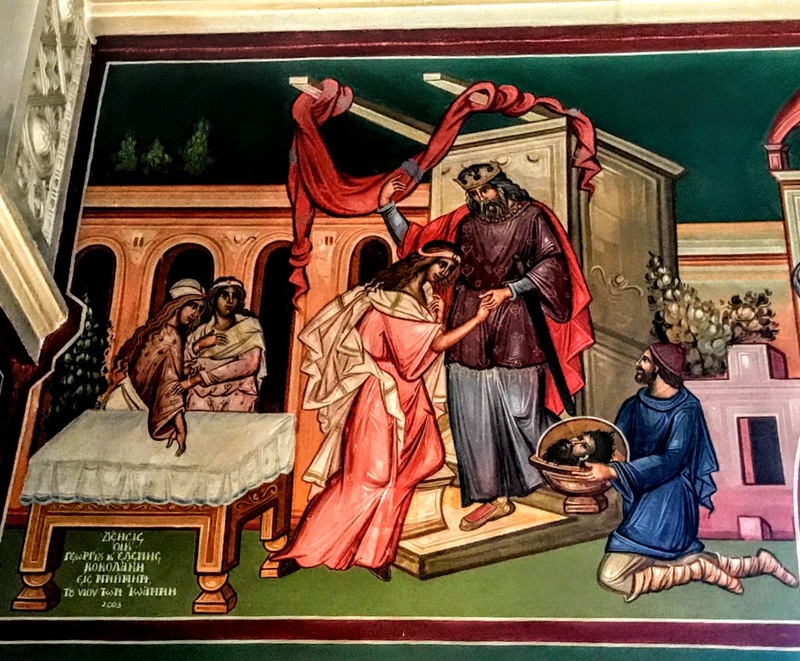 Cruel Herod has already executed Saint John the Baptist – long ago. Now he hears about the miracles and signs being worked by Jesus and his disciples. 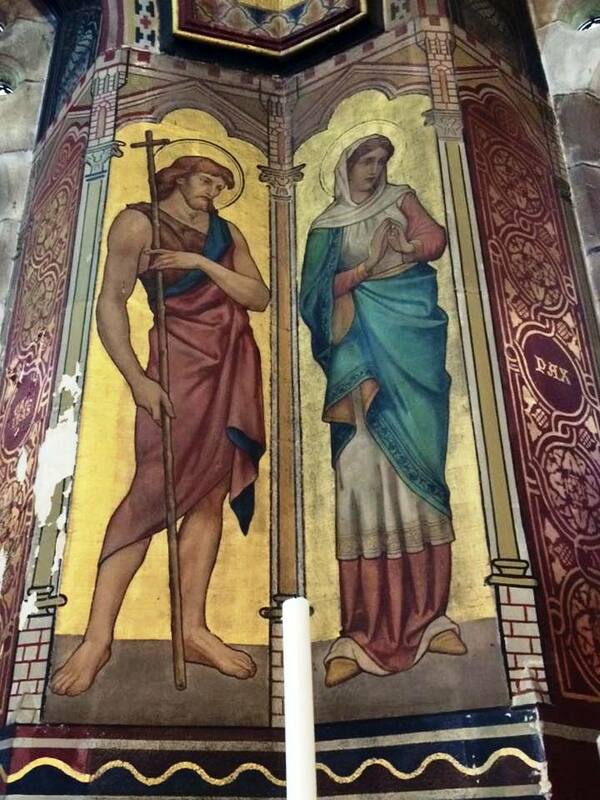 Some people think he is Saint John the Baptist, even though John has been executed. Others think Jesus is Elijah – and popular belief at the time expected Elijah to return at Judgment Day (Malachi 4: 5). On the other hand Herod, deranged Herod, who has already had John beheaded, wonders whether John is back again. And we are presented with a flashback to the story of Saint John the Baptist, how he was executed in a moment of passion, how Herod grieved, and how John was buried. At this point, the story reminds us of the cost of discipleship, and prepares us for the accounts later in this Gospel of the arrest of Jesus, his trial, including being brought before Herod, his execution, and his burial. 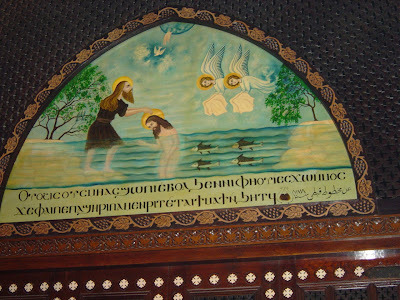 Saint John the Baptist remains a key figure for all traditions in the Middle East and beyond. In the Eastern Orthodox Church, he is the last of the prophets, providing the bridge between the Old Testament and the New Testament. 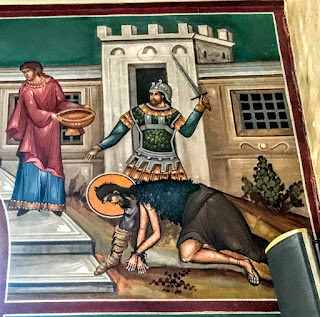 Several places claim they have the severed head of Saint John the Baptist, and have become centres of pilgrimage, including a church in Rome, in the past two churches in England, the Monastery of Saint Macarius in Wadi Natrun in Egypt, and the Umayyad Mosque in Damascus. When the late Pope John Paul II took off his shoes and prayed at the shrine of Saint John the Baptist in the Umayyad Mosque on a pilgrimage to Damascus in 2001, he sent out a clear message that Christians and Muslims can work together and can find more that unites us than divides us. 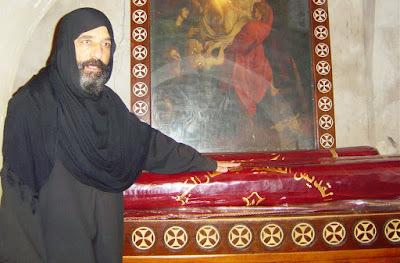 I have also visited the Monastery of Saint Macarius. Each day, this monastery receives large numbers of Egyptian and foreign visitors, sometimes as many as 1,000 a day, both Christian and Muslim. 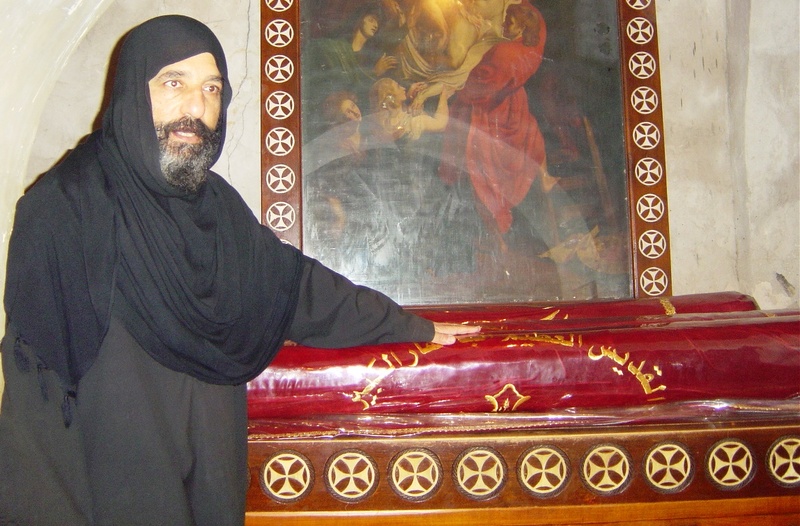 Despite the upheavals and violence in Egypt, this monastery is playing a significant role in the spiritual awakening of the Coptic Church. Going out into the desert to this monastery is not a retreat from the world; it is an invitation to a new commitment to renewal, ecumenism and dialogue. Those places associated with Saint John the Baptist can be reminders that pilgrimage and retreat are not withdrawals from the world, but are challenges to the ways of the world, particularly at times of injustice and violence. Those places associated with Saint John the Baptist in the Middle East, including Syria and Egypt, remind us that there is another way. That we are not disciples of Herod, that blood-letting for the sake of power and victimising people of religion is not the way for people of religion who share a vision of peace. Did you ever get mistaken for someone else? Or, do you ever wonder whether the people you work with, or who are your neighbours, really know who you are? I am thinking of two examples. Anthony Hope Hawkins, son of the Vicar of Saint Bride’s in Fleet Street, was walking home to his father’s vicarage in London one dusky evening when he came face to face with a man who looked like his mirror image. He wondered what would happen if they swapped places, if this double went back to Saint Bride’s vicarage, while he headed off instead to the suburbs. It inspired him, under the penname of Anthony Hope, to write his best-selling novel, The Prisoner of Zenda. What are you truly like? And would you honestly want to swap your life for someone else’s? Would you take on all their woes, and angsts and burdens, along with their way of life? It is a recurring theme for poets, writers and philosophers over the centuries, including John Donne, Izaak Walton, Shelley, Goethe and Dostoyevsky. More recently, it was the dramatic theme in John Boorman’s movie The Tiger’s Tail (2006), in which Brendan Gleeson plays both the main character and his protagonist – is he his doppelgänger, a forerunner warning of doom, destruction and death? Or is he the lost twin brother who envies his achievements and lifestyle? The doppelgänger was regarded as a harbinger of doom and death. 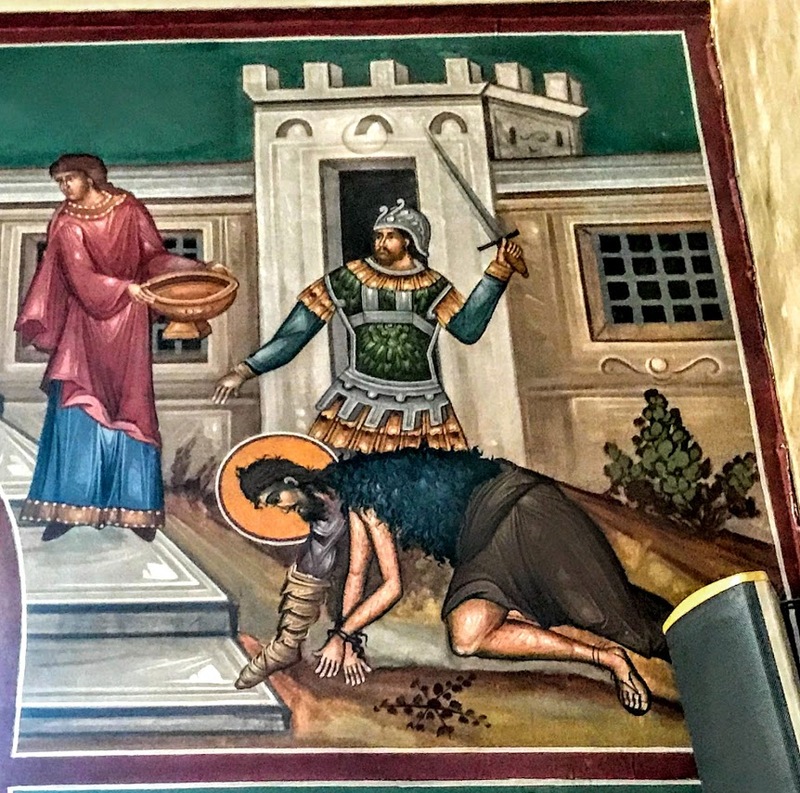 There is a way in which Saint John the Baptist, Saint John Prodromos or Saint John the Forerunner, is seen as the harbinger of the death of his own cousin, Christ. As well as attracting similar followers and having similar messages, did these two cousins, in fact, look so like one another physically? But Herod had known John the Baptist, he knew him as a righteous and a holy man, and he protected him. Why, he even liked to listen to John. Do you think Herod was confused about the identities of Christ and of Saint John the Baptist? Or is Herod so truly deranged that he can believe someone he has executed, whose severed head he has seen, could come back to life in such a short period? If Herod is that unstable and that mad, he is surely unsuitable for sitting on the throne. If Herod is deranged or exasperated, then his courtiers are confused. Some of them say Christ is Elijah – not just any old prophet, but the prophet that popular belief held would return at the great Passover, at the end of the days (see Malachi 4: 5). Others say he is ‘a prophet, like one of the prophets of old’ – the old order is passing away, a new order is being ushered in as part of God’s great plans for humanity and the whole of creation. Even before John was making way for Christ, God himself has planned for Christ’s followers to become members of his family, to be adopted as his children. 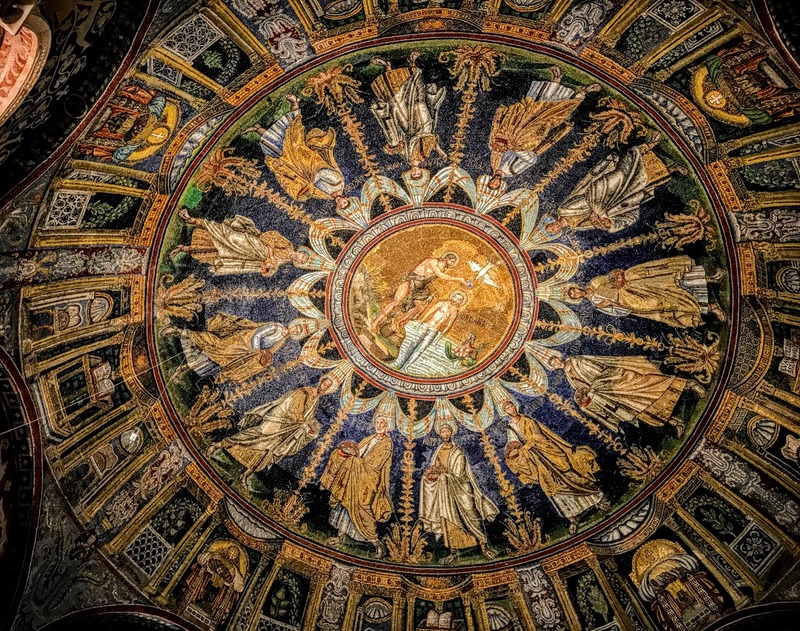 As Saint Paul tells us in the Epistle reading, the fulfilment of this is God’s will and God’s ‘pleasure’ (Ephesians 1: 5) – words similar to that heard after Saint John baptises Christ in the Jordan – when a voice from heaven says: ‘You are my Son, the Beloved; with you I am well pleased’ (Mark 1: 11). This plan, which will come to fruition when God’s eternal purposes are completed, is to unite all creation, all ‘heaven’ and ‘earth,’ in Christ. To be a disciple is to follow a risky calling – or at least it ought to be so. In the previous passage, Christ has sent out the disciples to preach repentance, to cast out demons, to cure sick people. But they are beginning to realise that the authorities are rejecting Christ. Now with Herod’s maniacal and capricious way of making decisions, discipleship has become an even more risk-filled commitment. But Herod’s horrid banquet runs right into the next story in Saint Mark’s Gospel where Christ feeds the 5,000, a sacramental sign of the invitation to all to the heavenly banquet – more than we can imagine can be fed in any human undertaking. The invitation to Herod’s banquet, for the privileged and the prejudiced, is laden with the smell of death. The invitation to Christ’s banquet, for the marginalised and the rejected, is laden with the promise of life. Herod feeds the prejudices of his own family and a closed group of courtiers. Christ shows that, despite the initial prejudices of the disciples, all are welcome at his banquet. Herod is in a lavish palace in his city, but is isolated and deserted. Christ withdraws to an open but deserted place to be alone, but a great crowd follows him. Herod fears the crowd beyond his palace gates. Christ rebukes the disciples for wanting to keep the crowds away. Herod offers his daughter half his kingdom. Christ offers us all, as God’s children, the fullness of the kingdom of God. Herod’s daughter asks for John’s head on a platter. On the mountainside, Christ feeds all, and although at the beginning all we can offer is five loaves and two fish, more than 5,000 are fed – and even then, 12 baskets are left over. Saint Mark places these two stories, one after the other, so we can see the stark contrasts between two very different banquets. During these tough times, people ought not to be ashamed if they and their families need food and shelter. Everybody has the right to food and housing. Herod chooses loyalty to his inner circle and their greed. Christ tells his disciples to make a choice in favour of those who need food and shelter. Herod’s banquet leads to destruction and death. Christ’s banquet is an invitation to building the kingdom and to new life. But how many of us in our lives would rather be at Herod’s Banquet for the few in the palace that to be with Christ as he feeds the masses in the wilderness? Who would you invite to the banquet? And who do you think feels excluded from the banquet? We may never get the chance to be like Herod when it comes to lavish banqueting and decadent partying. But we have an opportunity to be party to inviting the many to the banquet that really matters. Do you remember how as dusk was falling in the wilderness and the disciples saw the crowd were hungry? And they said to Jesus: ‘the hour is now very late; send them away so that they may go into the surrounding country and villages and buy something for themselves to eat’ (Mark 6: 35-36). Are we in danger of confusing Herod, the harbinger of doom and death, with Christ, who comes that we may have life and have it to the full? Who feels turned away from the banquet by the Church today, abandoned and left to fend for themselves? 17 For Herod himself had sent men who arrested John, bound him, and put him in prison on account of Herodias, his brother Philip’s wife, because Herod had married her. 18 For John had been telling Herod, ‘It is not lawful for you to have your brother’s wife.’ 19 And Herodias had a grudge against him, and wanted to kill him. But she could not, 20 for Herod feared John, knowing that he was a righteous and holy man, and he protected him. When he heard him, he was greatly perplexed; and yet he liked to listen to him. 21 But an opportunity came when Herod on his birthday gave a banquet for his courtiers and officers and for the leaders of Galilee. 22 When his daughter Herodias* came in and danced, she pleased Herod and his guests; and the king said to the girl, ‘Ask me for whatever you wish, and I will give it.’ 23 And he solemnly swore to her, ‘Whatever you ask me, I will give you, even half of my kingdom.’ 24 She went out and said to her mother, ‘What should I ask for?’ She replied, ‘The head of John the baptizer.’ 25 Immediately she rushed back to the king and requested, ‘I want you to give me at once the head of John the Baptist on a platter.’ 26 The king was deeply grieved; yet out of regard for his oaths and for the guests, he did not want to refuse her. 27 Immediately the king sent a soldier of the guard with orders to bring John’s head. He went and beheaded him in the prison, 28 brought his head on a platter, and gave it to the girl. Then the girl gave it to her mother. 29 When his disciples heard about it, they came and took his body, and laid it in a tomb. In addition, Hymn 471 (Rejoice in God’s saints) may be suitable; it is the processional hymn in next Sunday's broadcast Eucharist recorded in Saint Mary’s Cathedral, Limerick.